Remember that old wooden sled you loved as a child? Well, if it was a Lightning Guider, it was built in Duncannon, the small Pennsylvania town where I grew up. The Standard Novelty Works factory produced millions of these beauties until it closed in 1990. But as I found out during a recent trip in our RV, the fun still continues for folks of all ages at the Old Sled Works Antique and Craft Market. With 125 vendors tucked amid vintage machines, it's a shopper's paradise–but there's plenty more to see and do. For instance, a small museum chronicles the 86-year-history of the Standard Novelty Works and its popular sleds. I admired several models, plus some porch swings and coaster wagons, then perused old ads and patents on display. I couldn't resist dropping a few quarters in some classic games in the old-time penny arcade; there are more than 60 that date from the 1920s to the 1970s. It's a great way to show off your Skee-ball skills! Hungry? Check out Jimmy's Old-Fashioned Soda Fountain, an authentic 1950s eatery that serves everything from hot dogs to banana splits. Wash it all down with a thick milkshake or a birch beer. From a '50s-style table, we watched the Three Stooges on a black-and-white Philco TV. If you time it right, you just might get to sit at a cozy table for two inside a shiny 1953 Airstream trailer! Afterward, we climbed up the 144 steps of the 110-foot tower outside. The view was breathtaking, and we had a blast trying to drop a rubber duck into the wading pool below. Every New Year's Eve, we heard, a giant sled slides down the tower during the countdown to midnight. But no matter when you're in the area, I highly recommend you steer your runners toward the Old Sled Works! Duncannon is on U.S. Highway 11/15 in southeastern Pennsylvania, about 15 miles northwest of downtown Harrisburg. It marks the halfway point of the Appalachian Trail. The Old Sled Works (722 N. Market St.; 1-717-834-9333) is open Wednesday through Sunday; the soda fountain is open most weekends from October through May, but times vary, so call ahead to be sure. I have a Standard Novelty snow sled marked as #56 on the bottom of sled, in a circle with name lightning guider. Seems to be in good condition and is about 56 inches long. Have a 122 1/2 numbered sled in decent condition...anyway to find out worth? Hello fellow snow gliders! Hoping you can help: Barn Find! In the shed i find a vintage and completely intact (albeit some rust) straight runners Lightning Guider 123.5 sled that shows really well. The stamp underneath is as new and the graphics on top seem to be unmarred. I have tried unsuccessfully to date it. I have pics... can you help shed some light on this beauty? Thanks. I have a Lightning Guider mfg. by Standard Novelty Works #122 Duncannon, Pa. in very good condition. Can you give me an approximate worth on this sled. with a # 123 (I believe it is #123 -- not sure if another number follow it) This stamp is in a circle. Can you help me with an age ?? 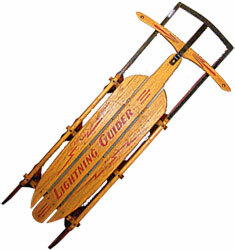 I have the Lightning Glider #125 that my parents gave me as a little girl in the 1950's. The wood is still in great condition, alitte paint chipping here and there on the iron. I use it now as a decoration sled lite up on the porch. Every year I bring it out for Xmas, it brings back so many memories as a kid enjoy a ride in the snow and her Daddy pulling the sleigh. I also have Lightening Glider stamped #125 Dancannon, Pa. I am decorating for porch decoration. I am 64 years old, so many memories of growing up Winter snows, with lane to our home snow drifted shut.. I recently acquired a Standard Novelty Works sled #123-1/2 "Anniversary' model. The sled is used but the graphics and wording on the front of the sled are in very nice condition. I would like to know its history and what it might be worth. Thank you and hope to hear from you soon. We love the sled.